They were possibly the most radical pension reforms in almost a century. Up to 18 million people were affected. 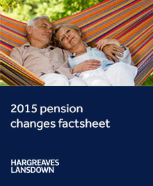 This factsheet explains concisely and in plain English the changes and how they could affect you. This guide is not personalised advice. Download a free factsheet - simply confirm the last three characters of your postcode below. Our factsheet is based on our current understanding of the rules. It is a broad summary and cannot cover every nuance. You should not take, or refrain from taking, any action based on this information. Please remember, taking money out of a pension will impact standards of living in retirement. The value of investments can fall as well as rise so you may get back less than you invest. Tax treatment can change and depends on your individual circumstances.